Biometrics technology is based on the principle of measuring and examining the biological traits of individuals, extracting the unique features from this acquired data and then comparing it with the template set stored in the biometric templates database. These unique biological traits are called biometric identifiers and can be of two types – physiological and behavioural. The physiological identifiers are related to the shape of the body whereas the behavioural identifiers are related to the behavioural patterns of individuals. 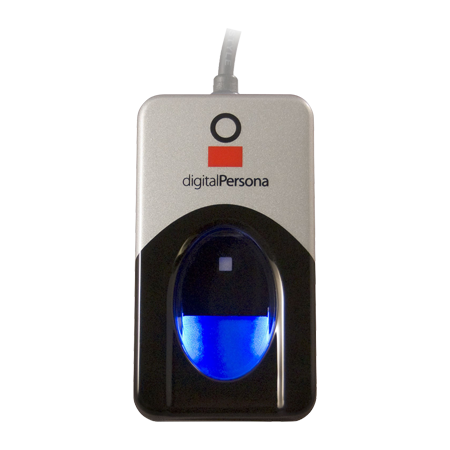 Physiological biometric identifiers include fingerprints, face, iris, palm, hand geometry etc. whereas behavioural identifiers include such characteristics as gait, voice, typing rhythm etc. The selection of a particular biometric identifier for use in a specific application is dependent on various factors such as universality, permanence, uniqueness, measurability, performance, circumvention etc. It is also dependent on application suitability. Some biometrics might be better suited to an application based on convenience and security. However, it is highly unlikely that a single biometric identifier will be able to meet all the requirements of every possible application. There are three main components in the security of a system – authentication, authorization and accountability. Authentication is the most fundamental of these three components because an individual needs to be authenticated first before he can access the system. Conventional authorization systems use passwords, smartcards etc. The main reason for selecting biometric technology over the traditional identification techniques such as the username/password systems is that traditional methods are too vulnerable to security breaches and simply do not provide sufficient security in today’s connected and data driven world. Password or token based systems provide access based on evidence of ownership or proof of knowledge. This is not really sufficient as tokens and passwords can be stolen by a variety of techniques. Biometrics is unique in the sense that it based on the inherent characteristic of the individual. It authenticates the user based on who they are as opposed to what they know or what they have. Another advantage of biometric identifiers is they cannot be guessed, forgotten, misplaced or easily forged unlike the knowledge-based and the possession-based identification schemes. When selecting a biometric trait for use in a particular application, the biometric trait is assessed on the following seven features. A biometric modality should possess these seven qualities in order to provide high performance and accuracy in biometric identification systems. What are unimodal and multimodal biometric systems? Biometric identification systems which use a single biometric trait of the individual for identification and verification are called unimodal systems. Biometric identification systems which use or are capable of using a combination of two or more biometric modalities to identify an individual are called multimodal biometric systems. The most important reason behind using multimodal biometric systems is to improve the recognition rate. When adopting biometric technology for identification, the most important pre-deployment question is whether to choose a unimodal or multimodal biometric system. We will discuss both these systems, the limitations of Unimodal biometric systems and how these limitations are overcome by the use of multimodal biometric systems. What are the limitations of unimodal biometric systems? Despite having many inherent advantages, the large scale deployment of biometric identification systems have been hampered due to various reasons. Biometrics is used in many applications such as border control and voter id issuance. Theoretically, Unimodal biometric identification might seem very proficient but in reality there are numerous challenges when enrolling large populations using just a single (Unimodal) biometric. The major issue with Unimodal biometric system is that no one technology can be suitable for all applications and hence using a multimodal biometric system will compensate the limitations of Unimodal biometric system. Susceptibility of the biometric sensor to noisy or bad data: The captured biometric trait might be distorted due to imperfect acquisition conditions. This limitation can be seen in applications which use facial recognition. The quality of the captured facial images might get affected by illumination conditions and facial expressions. Another example could be in fingerprint recognition where a scanner is unable to read dirty fingerprints clearly and leads to false database matches. An enrolled user might be incorrectly rejected whereas an impostor might be falsely accepted. It might not be compatible with certain groups of population. Fingerprint images might not be properly captured for the elderly and young children because of faded fingerprints or underdeveloped fingerprint ridges. Though the biometric traits are expected to exist among every individual in a given population, there could be some exceptions where an individual is unable to provide a particular biometric. For example, iris images might not be acquired if the subject has a pathological eye condition. Unimodal biometric systems are quite vulnerable to spoof attacks where the data can be imitated or forged. 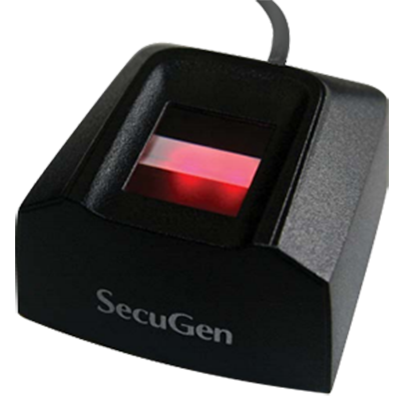 For example, fingerprint recognition systems can be easily spoofed using rubber fingerprints. Multimodal biometric systems merge two or more biometric technologies such as facial recognition, fingerprint, iris scanning, hand geometry, voice recognition etc. 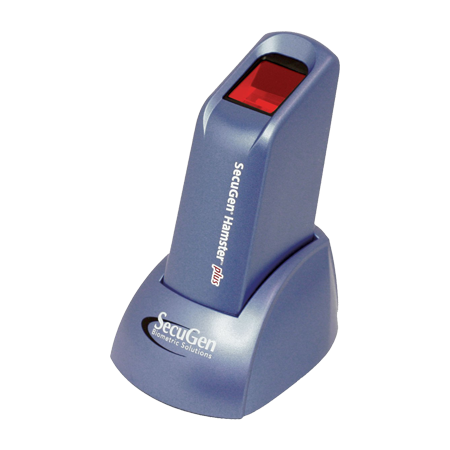 These systems take input from single or multiple sensors for measuring two or more different biometric characteristics. A system combining face and iris characteristics for biometric identification is considered a multimodal system irrespective of whether the face and iris images were captured by the same or different imaging devices. Also, the measures need not be mathematically combined in anyway. An example of this would be a biometric system which combines fingerprint and face recognition. This system allows users to be verified using either modality. In addition to improving the recognition rate, combining two or more biometric modalities might be more appropriate for different applications. Another reason might be simply customer preference. How do multimodal systems work? Given below is the block diagram of multimodal systems. In multimodal biometric systems fusion is achieved by running two or more biometric traits against two or more different algorithms which is then used to arrive at a decision. This kind of a technique proves to be extremely useful in situations such as a large scale civil ID scenario, where the identity of thousands of people need to be authenticated at one time. Also, having an additional method of verification overcomes the possibility of inconvenience which can be caused by the malfunctioning of the primary biometric input. These systems take a single biometric sample from a single sensor and then process it using two or more different algorithms. These systems use one or more sensors to capture samples of two or more different samples of the same biometric trait. An example of this could be a system capturing images of multiple fingers. These systems use two or more distinctly different sensors to capture the same instance of a biometric trait. These captured samples are then processed using a single algorithm or a combination of algorithms. Example of multi-sensorial biometric systems is where the same facial image is captured using a visible light camera and an infrared camera fixed with a particular frequency. We use more than one biometric modality in multimodal biometric systems and hence we have more than one decision channels. Thus arises the need to design a mechanism which can combine the classification outcome from each biometric channel and this mechanism is known as biometric fusion. This fusion combines the measurements from different biometric attributes to enhance the strengths and decrease the weaknesses of the individual measurements. Fusion can be used to address a number of issues faced in implementation of biometric systems such as accuracy, efficiency, robustness, applicability and universality. There are various levels of fusing the biometric traits which can be used to increase robustness of the multimodal biometric system. They are sensor level fusion, feature level fusion, matching score level fusion and decision level fusion. Given below is a diagram showing the fusion levels in a multimodal biometric system. In sensor level fusion, we fuse the biometric traits coming from different sensors such as fingerprint scanner, iris scanner, video camera etc. to form a merged biometric trait and process. In feature level fusion, signals coming from different biometric channels are first processed after which the feature vectors are extracted separately from each biometric trait. The feature vectors are then combined to form a composite feature vector using a specific fusion algorithm and then used for further classification. In feature level fusion, some reduction techniques need to be used in order to select only the useful features. 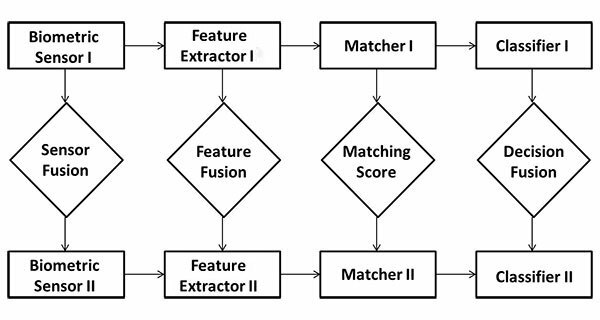 Features contain richer information of biometric traits as compared to matching score or decision of matcher and thus fusion at the feature level provides better recognition results. It has also been observed that feature level fusion provides more accuracy when the features of different biometric modalities are compatible with each other. In this fusion level, the feature vectors are processed separately rather than combining them. Then an individual matching score is found and based on the accuracy of each biometric channel, we then fuse the matching level to find a composite matching score which will be used for classification. We can use various techniques such as logistic regression, highest rank, Bayes rule, mean fusion etc. to combine match scores. In addition to this, another important aspect of this fusion is the normalization of scores acquired from different modalities. We can use techniques such as Min-max, z-score, piecewise linear etc. to achieve normalization of the match scores. Matching score level fusion has lesser complexity than the other fusion levels and hence it is widely used. In decision level fusion, each biometric trait is first pre-classified separately. The individual biometric trait is first captured and then features are extracted from the captured trait. The traits are classified as either accept or reject based on these extracted features. The final classification is obtained by combining the outputs of different modalities. The accuracy of a multimodal biometric system is measured by the errors in image acquisition and matching of the biometric traits. Image acquisition errors include failure-to-acquire (FTA) rate and failure-to-enroll (FTE) rate. Matching errors consist of false non-match rates (FNMR) in which a legitimate subject is rejected and a false match rate (FMR) where an intruder is granted access. Multimodal systems have almost zero FTA, FTE, FNMR and FMR rates. In a scenario where millions of people need to be enrolled in a system and some people might be facing problems with a particular biometric trait, multimodal systems can overcome this limitation by using a different biometric for that segment of the population. This will ensure almost zero failure-to-enroll (FTE) rate. Multimodal biometrics can reduce data distortion. In cases where the quality of a biometric sample is unacceptable, the other biometric trait can be used. For example, if a fingerprint scanner rejects the fingerprint image due to poor quality using another biometric modality such as facial rejection will lower the false rejection rates. Multimodal biometric systems are very difficult to spoof as compared to unimodal systems. Even if one biometric modality could be spoofed, the individual can still be authenticated using the other biometric identifier. We have discussed the features of both unimodal and multimodal biometric systems. We see that multimodal biometric systems are more robust, reliable and accurate as compared to the unimodal systems. 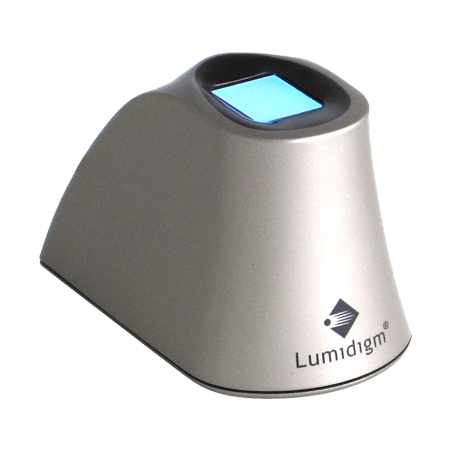 Prominent biometric combinations include fingerprint, facial and iris recognition. Multimodal systems overcome the various limitations of unimodal systems and hence are suitable to many industries such as healthcare, civil id and financial industries.